Over 88,000 guests rode THE POLAR EXPRESS™ with the Great Smoky Mountains Railroad in 2017 and we hope to see you in 2018! The 1¼ hour round-trip excursion comes to life as the train departs the Bryson City depot for a journey through the quiet wilderness for a special visit at the North Pole. Set to the sounds of the motion picture soundtrack, guests on board will enjoy warm cocoa and a treat while listening and reading along with the magical story. Children’s faces show the magic of the season when the train arrives at the North Pole to find Santa Claus waiting. 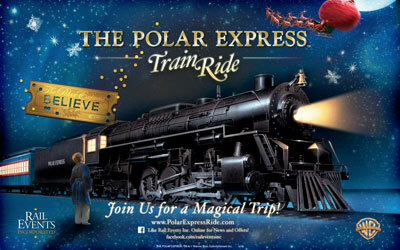 Santa will board THE POLAR EXPRESS™, greeting each child and presenting them with a special gift as in the story, their own silver sleigh bell. Christmas carols will be sung as they return back to the Bryson City Depot. We strongly discourage attempting to purchase your tickets the day of as a majority of dates and/or times are sold out. No matter how you purchase tickets, they’ll be waiting at will call. Ticket prices vary by class of service. All departures are from the Bryson City Depot in Bryson City, NC. Plan on being here by 1 hour before your departure.